Join us Saturday 24 November for our 2018 Autumn Seminar ‘TPNW, the need for the UK to sign, how and why’. 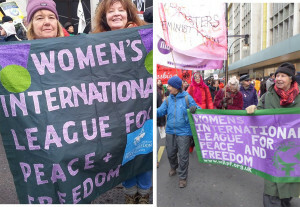 Every year we hold an Autumn Seminar which all UK WILPF members are invited to, as well as our friends from other organisations and anyone else interested in our work. This year, we continue our campaign for the UK to ratify the Treaty on the Prohibition of Nuclear Weapons (TPNW). 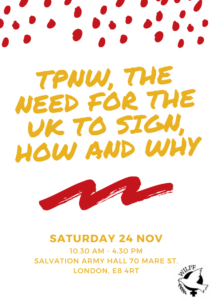 Join us Saturday 24th November for ‘TPNW, the need for the UK to sign, how and why’. Salvation Army Hall, 70 Mare Street, London, E8 4RT. 10.30am – 16.00pm. Throughout the day we will hear from leading speakers (TBC) on issues surrounding the treaty including the gender perspective, the environmental and economic impact of nukes and international law. You will also receive top tips on how to lobby your MP for the ratification of the TPNW as well as all the knowledge and information needed to influence others to get involved. The event will be free with a suggested donation of £10 towards lunch. Find out more on Facebook here and get your free ticket here. We are keen for our event to be inclusive, and so we are happy to provide help with expenses if you require this. The venue also has disabled access. Please contact ukwilpf.peace@gmail.com for more information.